When two teddies, Tilly and Gruffy, are abandoned in a box of unwanted toys, they decide to face the world and find someone else to love them. 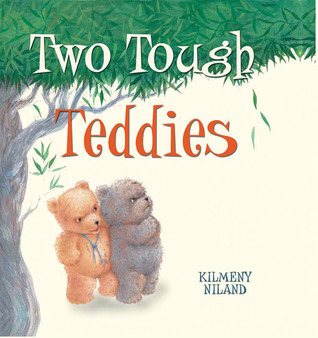 Kilmeny Niland’s warm, affectionate story explores a theme familiar to all—sometimes we get what we want only when we stop trying so hard. The saddest and sweetest and most beautiful book ever! This is a book that sends you on an emotional roller coaster. Two darling teddies are abandoned in a park and on the hunt for someone to love them. They try to be loud so people can hear them, and try to be brave despite their scruffy appearance. This is the kind of situation that got me bawling in Toy Story 2 and 3 and I think having it in book form is just as heartbreaking. Just crush my heart, Niland. Crush. My. Heart. They realise they do have someone to love them because they have each other and that was the end of me because that was the sweetest thing possible and my heart broke for these teddies. I wanted to love them. I wanted to take them home because it was so adorable that they were trying so hard to be tough and brave for people but that scared them away instead. What makes it sweeter/sadder is that Niland’s illustrations portray these teddies in a way that you can’t help but love them. They are scruffy but they also look lost and unsure. They try their hardest and seeing their crestfallen faces only adds to the narrative. The illustrations are both full page colour and single images on a blank background, both of which help express how big a world the teddies have become lost in, and how out of their depth they are. Niland also cleverly uses the teddies perspective in the use of angles and point of view regarding the nature that surrounds them and the animals they attempt to interact with. There is a happy ending so it isn’t all bad news, and Niland reinflates my heart and by soul because there is a beautiful ending and goes to show you can be loved even if you aren’t always brave and loud and tough.